Funko has come up with another great series of collectible figures. These Wacky Wobblers are stylized bobbleheads in a cartoonish and recognizable style. The series has several entries in the Star Wars line; here are some from The Force Awakens collection. Chewbacca, Han Solo's Wookiee pal, is a big, fluffy, totally huggable brown creature. His kind is just made to be turned into plush stuffed toys. And there are a lot from which to choose! Here are some of our favorite Chewie plush toys. 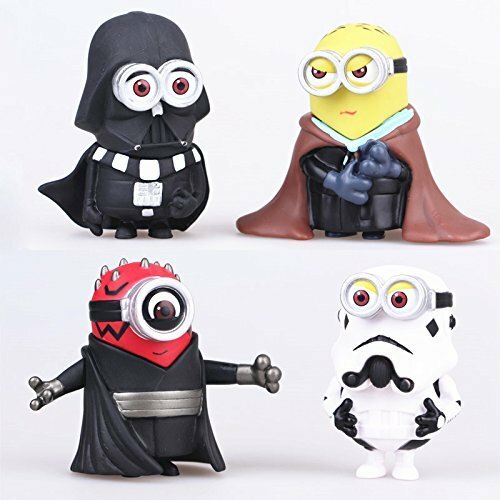 This funny set of mashup figures is perfect for anyone who is a fan of both the Star Wars saga and Minions from Despicable Me! There are four figures of Minions dressed up as Dark Side characters. These figures are about 3" tall. The set includes four different characters. Minions are dressed up as Darth Vader, Count Dooku, Darth Maul, and a Stormtrooper. Get this fun set for play or display!